Other than my family and cookies, yarn and rainbows may be two of my next favorite things. As I’ve been perusing Insta lately, fiber art rainbows have been catching my eye. I’ve seen some as wall hangings and some worked into weavings. I am always in awe at these beautiful creations, and I decided that it would be fun to try my hand at them! I mean, yarn and rainbows! How could I not?! These rainbows don’t require a lot of supplies, and the cost for this project can run anywhere from $5-$30 depending on how big you want your rainbow to be. I would recommend starting smaller so that you can practice, then when you have had a little more experience, you can buy the more expensive supplies to make bigger rainbows. There are luckily lots of inexpensive ways to make these so that you can make a bunch and perfect your rainbows! Cotton rope - I like the cotton variety because it is softer and easier to cut through. Regular roper would work to. You can find some smaller varieties at the craft stores, but I found the thicker cotton rope from Amazon. I bought a 1” wide rope from Amazon HERE. I also bought the 1/2” pink rope from Amazon HERE (this link also has a bunch of different colors of rope). Roving Yarn - if you prefer the look of roving for your rainbows, you can use this in place of rope. I bought mine from Michaels. Yarn needle. Like the one from Amazon HERE. White cotton string. From a craft store or Amazon HERE. Embellishments like pom pom trim, twine, handmade pom poms. I also made a list on my Amazon page with all of these supplies together in one place. You can find my idea list HERE. Cut your rope into several pieces. I like to lay them out while I cut to make sure the ends are almost even. If you don’t want to buy thicker rope, you can combine several strands of smaller rope (or even yarn!) to make one thicker strand. Use scotch tape to hold the strands together, but make sure to not tape too close to the ends. If your rope is wanting to fray, you can also use scotch tape to keep it together while you wrap it. Start wrapping the outer arch of rope with yarn. I like to wrap the end of the yarn around once or twice, then cover it as I’m wrapping the rest of the yarn. This will hold the end in place and hide it. Leave some rope at the end unwrapped to give your rainbow a “cloud” look. Wrapping your rope will actually lengthen it. And certain yarn will lengthen it more than others. It is not uncommon for the ends of your arches to be different lengths after wrapping. If you want your ends to be even. make sure you leave enough space at the ends so that you can trim them to match up. As you wrap, try to keep your tension consistent so that it has a uniform look. Also try to make sure that you are covering all of the rope so that you don’t have bare spots. If you choose to leave one arch without any yarn, make sure to at least tie some twine or string around the ends of the rope so that it doesn’t unravel completely. I also like to try to match my starting points and ending points for each arch to make a more uniform look. When you reach the end of your arch, cut your yarn, tie it around to make a sort of knot, then using a yarn needle, go up and through some of the wrapped yarn to hide and secure the end. Once all of your arches are wrapped, you will stitch them together using a large yarn needle and white string. String your needle doubling up the string, and tie a knot at the end. Feed your needle through just a bit of the back of each arch on the back side like in the photo below. You are trying to run the string back and forth around your rainbow to secure it. In order to keep the string as hidden as possible, I fed the string under the yarn in between stitched rows. Continue stitching through the rainbow all the way around. The back of your rainbow will look something like this when you are done. If you want to add embellishments like pom poms, now would be the time to hot glue those on. You can also trim your ends to make them more even at this point as well. Now you can display your rainbow beauties! I actually did this craft with my seven-year-old daughter and her friend, and they were totally able to do it! They needed a little help with tying the yarn onto the rope and again at the end of the rope, and I obviously didn’t have them stitch the rainbow together. To speed up the process, I tried hot gluing the arches together, and it worked! I don’t think I would use hot glue on my rainbows because I like the way the stitched rainbows look more, but hot glue can work in a pinch! Now you can enjoy your rainbows! Make tiny ones as pins, little ones as key chains, and make big ones to set on your mantle! These, of course, make a darling wall hanging, but you can do so many things with this technique! I even made a garland using the yarn wrapping technique! Instead of leaving the rainbow shape open, I tied it together to make a loop. Super easy, and really fun! I’m sure that these colorful rainbows will brighten up your March and spring decor too! Why are tiny things always so adorable? Well, these tiny crochet hearts are no different! 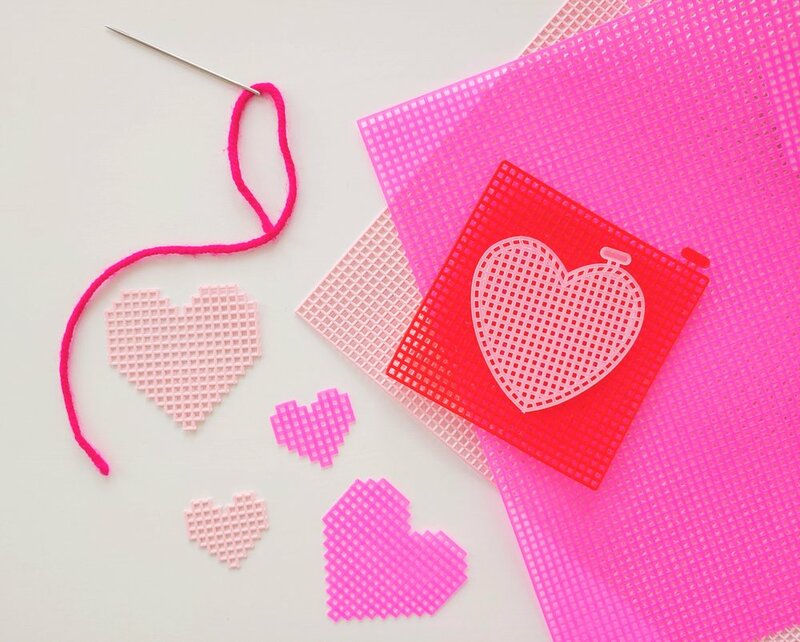 These hearts are easy to make and can become the perfect Valentine’s Day gift! Small Crochet Hook. I used a size 1.65mm hook. You can watch my video tutorial below to see how to make these little cuties! I hope you make tons and share the love this Valentine’s Day! I have a slight obsession with bottle brush trees. I mean, what is not to like?! I discovered how to dye my own trees a few years ago, and ever since, I have been dying trees for the Christmas season in a rainbow of colors. I love putting them up on my mantle and kitchen table and I’m always a little sad when it is time to take them down. This year, I decided that I didn’t want to put my bottle brush trees away after Christmas. Who says that they can only be Christmas decorations? My solution? A Valentine’s Day Village! I pulled out all my trees in various shades of pink and white and created a little village to go with it. I cut the houses with my Cricut (they are Winter Woodland and Anna’s Holiday Images) in pink and red paper, and arranged them on my mantle with the colorful trees. It is the perfect Valentine Village! As you probably already know from my woven rainbows (see THIS post), I sort of have a thing for plastic canvas. I know it is kind of retro, but it is just so much fun for crafting! Because it is plastic, it holds its shape well and because the holes are larger than cross-stitch fabric, you can use yarn (also one of my favorite things!) to make your stitched designs. And, it now comes in fun colors! You are no longer limited to just clear/white! For Valentine’s Day, I thought it would be fun to make little hearts out of plastic canvas then stitch them with fun designs and words. 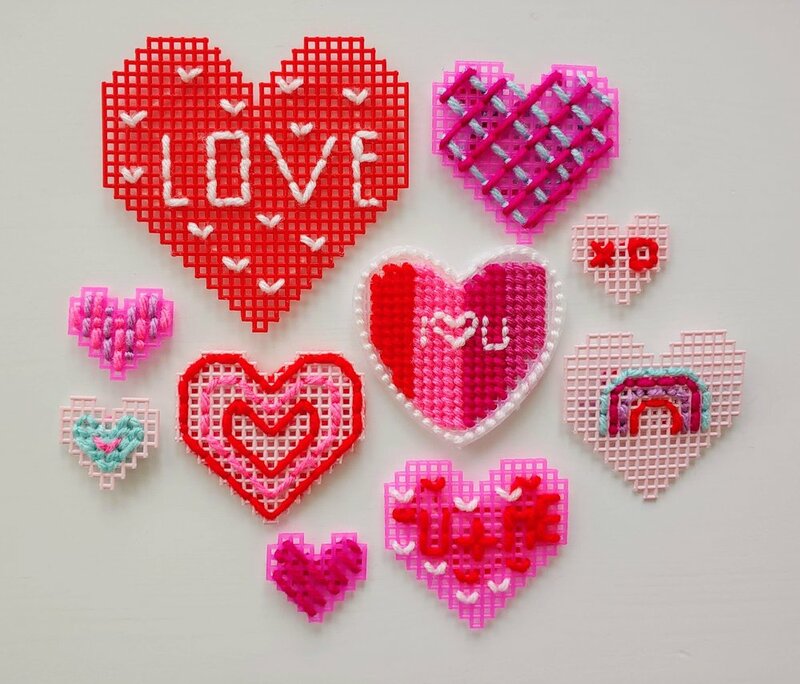 This is a super easy craft, and if your child is safe with a needle, he or she could make some fun Valentines for their friends! To make these fun valentines, you need some plastic canvas. I was able to find these lovely colors at Michael’s, but Amazon also has some light pink canvas in a bulk pack HERE. I also found pre-cut hearts at both Michael’s and Amazon HERE. The pre-cut hearts make it super easy with no cutting of the canvas, but they only come in the clearish-white color. So if you want to skip the canvas cutting step, you could just go with the pre-cut hearts. You will also need a large yarn needle. I like a size 18 yarn darner. Amazon has a set of six needles HERE. I prefer the metal to the plastic for this craft because you want your needle to be strong enough to get through those tight little spaces. And of course, you need yarn in all sorts of colors. This is a perfect craft to use up your yarn stash. If you are going to cut your own hearts, you can use the above photo as a guide. For the tiny heart, I cut a piece of canvas that measured 9 squares across by eight squares tall. You want your across number of squares to be odd so that you can have your center point at the bottom of your heart. The tall number should be even. For my bigger heart above, I measured 17 across and 16 tall. I liked the design above for my hearts, but you can really do anything that you would like. The trimming takes a little time, so just be patient, and make sure you have a pair of sharp but not too thick scissors. You need to cut into some of those tight little areas with your scissors, so you don’t want a pair that is too thick. Once your hearts are ready, you can start stitching your heart out! If you refer back to my plastic canvas rainbow post, you can get the details about stitching into this canvas. Because there is no right or wrong way to stitch these, you can really do any design you would like. Make sure that you weave your ends in so that you don’t have yarn hanging out, but, really, that is the only thing to worry about. Have fun with these! What do I do with my hearts once they are done? Well, you can do all sorts of things! You could attach magnets with hot glue to the back, you can make them into pins by hot gluing pins to the back, or you could add a keychain to and a little felt to the back of the heart to make it look tidy from the back side. Now you can wear your heart on your sleeve (or front of your sweater!) and spread some Valentine’s love! If you haven’t already gathered from my other posts, I am a fan of pom poms. Like, a big fan. Pom poms are what started my little business, and I will always be drawn to their colorful softness. I finally made a video showing how to make the perfect pom pom! The Paper Studio Scissors - I bought these at Hobby Lobby, but any thin, very pointy, sharp scissors should work. I buy most of my yarn from Hobby Lobby, Michael’s, and Walmart. You can find great yarn in lots of craft and specialty stores. Now, go make a million pom poms and enjoy their fluffy goodness! I am a big fan of Hygge. Like a big fan. It is the one thing that gets my California soul through cold Utah winters. (One of my favorite books is The Little Book of Hygge. If you haven’t read it, you need to! Click HERE to find it on Amazon!) Hygge is an overall feeling of coziness, and in the winter, I want to be as cozy as possible. These pretty, yarn wreaths are the perfect cozy, hygge touch for your home for the winter. Super chunky yarn. I bought mine at Michael’s and Hobby Lobby, but Amazon does have some as well if you want it shipped to you quickly. Just pay attention to how many yards you get with each skein. The big skeins from Michael’s have about 54 yards, but you probably only need about half or less of a skein to make a 12-18” wreath. The Michael’s yarn that I like is the Loops and Threads Free Spirit line. You can find it HERE. This yarn is a little pricey if it isn’t on sale, so make sure you wait for a sale or wait for a coupon, or even better, wait for a sale AND a coupon that can be used on sale items. I have always done this when I have bought this yarn, and I haven’t ever spent more than $20 for a skein. Hobby Lobby also has chunky yarn, but it isn’t quite as thick as the Michael’s yarn. The line I like is the Yarn Bee Big Yarn found HERE. I would also wait for a sale on this yarn or I would use a coupon. Amazon also has chunky yarn in quite a few color options. One option is available HERE. I would probably get the 1.1 lb. skein to ensure that you have enough. HERE is a 2-pack of 12” frames. HERE is a five-pack of 8” frames. HERE is a 2-pack of cute heart frames. HERE is a 14” frame. Large crochet hook. I would use a size S or larger. You can find many on Amazon, but HERE is a great option. Here is my first ever YouTube video on my Apricot Polkadot channel! I thought it would be easier to show this crochet technique though video rather than just through photos, so here it is! Just keep in mind that you are doing a single crochet all the way around. When you would go through the stitch, you will grab your yarn on the inside of the frame, and when you yarn over, you will grab your yarn on the outside of the frame. Hopefully that will make more sense as you watch it on the video! Michael’s sells two types of finger loop yarn. One is the Red Heart brand that you can find HERE, and the other is the Loops and Threads brand that you can find HERE. Amazon also has fun colors of Lion Brand finger loop yarn found HERE. Styrofoam Wreath. You can get these in different sizes at craft stores, or you can find a 14” HERE or a 16” HERE. When your wreaths are finished, you can add any embellishments that you would like. I like the simplicity of a pretty velvet ribbon on these wreaths because I feel like the are lovely enough to stand for themselves. You can definitely add a scrappy layered ribbon or a few pom poms or felt flowers though as well. Make it yours! I’d love to see your finished wreaths! Tag me at Apricotpolkadot on Instagram so that I can see your beautiful creations! It’s time to get ready for a new temperature blanket! I loved crocheting my 2018 blanket, but I am also really excited to get going on a new one with new colors and a new pattern! During 2018, I made a granny hexagon temperature blanket, crocheting one hexi a day. I also only used ten colors. This year, I am going to use 16 colors because I want a bit more variety, and I am going to be using a pattern that I have created that involves bobble stitch, double crochet, and single crochet. I bought all my yarn from Hobby Lobby and all but two of the colors are I Love This Yarn (ILTY) brand. The other two are Crafters Secret (CS). Here is my temperature color chart based on the weather where I live. If you live in hotter or colder climates, you could adjust your scale accordingly. For my pattern, I am going to have a row of bobble stitch followed by a row of double crochet. For the bobble stitch rows, I am going to divide those into three days per row so that I am only stitching a third of the row each day. On the double crochet rows, I am going to divide those in two so that I only do a half of the row per day. So every five days will give me two complete rows. I am doing this so that the blanket doesn’t end up incredibly long. Plus it makes it easier to complete each day! For bobble row: complete 62 stitches per day times three days. Bobble stitch every fifth stitch with double crochet stitches in between. For double crochet row: complete 93 stitches per day times two days. Continue alternating bobble row and double crochet rows throughout. I’m also going to move the position of the bobble stitches so that they aren’t lined up on top of each other between the rows. I’m excited to see how this turns out! If you decide to do it too, make sure you tag me and share your progress! If this blanket seems like a bit too much to take on this year, you can always join along with our temperature cross stitch! You only have to cross stitch one 5 square by 5 square box each day, but it is the same concept as the blanket. If you do want to make your own temperature cross stitch, you can find the pattern HERE in my Etsy shop! In my life before kids I was a seventh grade English teacher. Part of the reason I became and English teacher is because I love reading and I love books and I wanted to share that passion with the kids I taught. I am still always reading at least three books at a time: I have one that I’m listening to, I have one on my bedside table to read at night, and I have one that I’m reading with my kids. With Christmas just around the corner, I decided to post a few of my favorite crafty and creative books to maybe help you find the perfect gift for that maker on your list! I’ve linked each book to Amazon and have created a list on Amazon with my favorite book picks! You can quickly access my book list HERE. I keep A Book that Takes Its Time on my bedside table and read a little bit every night. I like to call this a “pretty book” because the inside is just beautiful. There are fun, creative ideas inside to help you be more mindful in your every day life. This is one of my favorite gift-giving books because it is just so lovely! If you are wanting to try your hand at different types of art, 365 Days of Art is perfect for you. This book has an an artistic activity for every day of the year. I love the variety of art that you get to use and try out in this book, and it is a great way to get those creative juices flowing each day. This book is darling for the little kids on your list. I collect Russian nesting dolls, so I knew I had to have Masha and Her Sisters, but my kids, who aren’t even all that young, loved this book too! The sister nesting dolls are all stacked on the different pages, and the illustrations are adorable. Tiny Town is also by Suzy Ultman the author and illustrator of Masha and Her Sisters and I just could not resist this cute house shaped book! Each page is a different store in the town, and again, the illustrations are just darling. This is a board book so it might be good for the little kiddos in your life, but even my older girls love this one too. My husband actually gave me a copy of A Hat for Mrs. Goldman last year for Christmas because he knows of my love for yarn and pom poms. This is the sweetest story about a girl who wants to do something nice for her neighbor Mrs. Goldman. She decides to try to knit Mrs. Goldman a hat, but it doesn’t go exactly how she wants. I love how this story teaches about service, love, and kindness. Plus, it comes with a knitting pattern for a hat at the end! Draw Every Day Draw Every Way is another daily art activity book. While the 365 Days of Art book focuses on different art techniques, this one focuses on drawing different items. It’s a fun way to practice those drawing skills with different types of pen and paper too. Craft the Rainbow spoke to my soul before I even owned it! I love crafting and I love rainbow things, so how could this not be an amazing book?! This book has a bunch of colorful paper projects, and it is another “pretty book.” It is a feast for the eyes. Any crafty person will love this beautiful book. When I get the chance, I love coloring in adult coloring books. I bought this one a few years ago, and the patterns are fantastic. I have a thing for Scandinavian design, and these designs lend themselves so well to coloring. I saw this book Extra Yarn on a fellow Instagramer’s feed a few months ago, and I knew that I needed to get it for my kids. I do happen to be a yarn lover, but this book tells a story of a girl who finds a box of yarn. Miraculously, this box never runs out of yarn. It has a sweet message about spreading happiness and joy and how happiness is something that cannot be bought or taken from someone else. This book is even a Caldecott medal honors winner. While this book isn’t necessarily a craft book, Pride and Prejudice is one of my all-time favorite books, and this illustrated version is amazing. It comes in and out of stock on Amazon, but if you can grab it while it is in stock, do it! The illustrations are beautiful and are such a fun addition to the story. And, bonus! It’s even on sale right now! This set comes with 10 different sizes of pom pom makers (including the huge ones and teeny tiny ones! ), and it comes with a tassel maker too! You can use the big maker to make these giant ornaments/gift toppers. Make sure you follow the directions that come with the set so that you don’t have your pom pom fall apart! I’m thinking I should do a video tutorial on this soon! I even ended up making a pom pom as my tree topper for my pom pom tree! I just love this thing! If you make some giant pom poms, make sure to post them on Instagram and tag me so that I can see your creations! Pom Poms and Tassels in your choice of colors. I started with a red and green base, then added a few colors that complement those colors. Colorful wood beads. I like THESE from Amazon. Burlap inspired stockings. I bought THIS three-pack. Pom Pom trim. You can find a cute multipack HERE. Wood embroidery hoops in various sizes. Find some HERE. Kraft wrapping paper. THIS is a cute set. Wood dowels cut into various lengths. Let’s get crafting! If you are short on space and can’t fit a full Christmas tree into your home, this wood dowel and pom pom tree could be the perfect solution! I mounted my tree on a foam board, but you could also connect your dowels with hooks and hang it directly on your wall. I cut dowels into different lengths, then added large, colorful pom poms to the dowels for ornaments. You can have your very own pom pom tree! I also love wrapping gifts with yarn and pom poms. I use a natural, kraft wrapping paper so that I can add lots of colorful touches with yarn. You can tie your pom poms directly onto a string around the gift. I made an extra large pom pom for one of the gifts, but the beauty of this one is that it can double as a Christmas ornament as well! I attached these extra large pom poms to a lot of the gifts I gave out last year, and then told the recipients that they could hang them on their trees. It’s the gift topper that keeps on giving! The garland possibilities for bright colors and natural wood beads is endless! I made three different garlands for my home. One I used only beads but I used natural wood beads with colored wood beads. I tried to match the colors of the beads with the colors of my pom poms. I made another garland with pom poms and natural wood beads. The third was a combination of wood beads, tassels, and pom poms. I also attached large tassels to the ends of the garlands for a little added pop. I like to string these on jute cord because it is a little stronger than just typical string. Plus it adds to the natural look. You will need to use a needle for stringing through the pom poms, so choose a needle with a large eye that can fit the jute cord. Next up, I made a few wood embroidery hoop wreaths. I wanted each one to be a little different, so I used different techniques for each one. On one, I just hung a bunch of yarn and pom pom trim that would drape down. On another, I made mini garlands out of tassels and beads to string from side to side. On the last, I hot glued pom poms directly onto the hoop. Each hoop can be hung with chunky yarn. These would be perfect above your mantle, on your wall, or on your door. To make colorful, burlap stockings, I used plain stockings then added pom pom trim, yarn, and wood beads to dress them up. I hot glued the trim to the stockings for some instant color. I also used yarn to “embroider” little x’s to one of the stockings. To one of the hangers, I looped in a strand of beads and tassels that would dangle down. The last fun addition to my decor are these pom pom branches. My husband was cutting branches off of one of our trees recently, and I thought that they somehow needed to show up in our home decor! You can’t get much natural than wood branches, so I decided to incorporate them into our Christmas decor. I hot glued a few pom poms to the branches to dress them up a bit. When I finished making these branches, I realized that they looked a bit like Whoville on the Grinch…which made them even more perfect for Christmas! Don’t be afraid to use those bright colors in your Christmas decor! By adding the right amount of natural neutrals, you can easily decorate with all of those oh-so-fun bright colors! Have a Merry Christmas! Eyeballs and Ghosts - Spooky Handmade Halloween Decor! If you are looking to add some spooky, easy Halloween decor to your home, look no further! If you have black and white yarn, you can make some super cute Halloween decorations! I did a segment on Studio 5 last October, and I thought it would be fun to bring it back! Here’s the whole segment so that you can see how to make these crafts! These pom pom eyeballs are super easy. 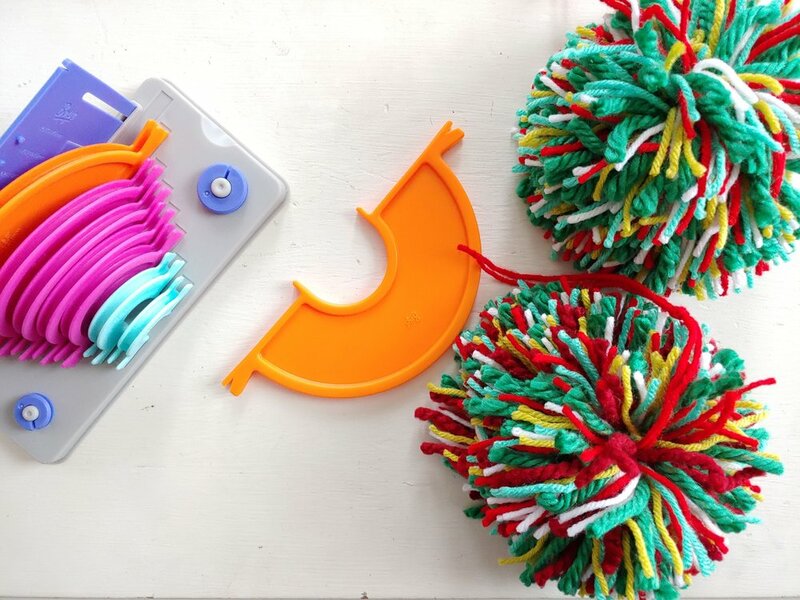 You begin by making a pom pom as you would any other pom pom, but you will start with black in just the center of your pom pom maker. Once you have enough black for a pupil, use your white yarn and fill in all the rest of the pom pom. I’ve shared the video from the Studio 5 segment that shows how this will actually look. Then you trim your pom pom into a circle, and that’s it! You have a soft, fuzzy, spooky eyeball! You can string these little eyeballs onto a garland or you can glue them or stick them all over your house. I like to put them in my plants to make them instant Halloween decor! To make the ghosts, make a tassel out of white yarn. You can make these chunkier or skinnier with more or less yarn in your tassel. Then cut out some eyes out of black felt. These can just be glued on with a fabric glue. Attach these to a string for a garland or hang them from your door for a spooky entryway. These are super easy but super cute! I’d love to see your eyeballs and ghosts if you make some for your home! Make sure to tag me in your photos @apricotpolkadot on Instagram! If you are a child of the 80s like I am, you might remember home decor items made out of plastic canvas. My mom bought me a book with all sorts of plastic canvas crafts, and I remember practicing my stitching on this gridded-plastic. You may remember the lovely kleenex box covers made out of this canvas as well or even baby nursery decor. Thanks to the rigidness of the plastic and the ability to use yarn as opposed to embroidery thread, this craft medium lends itself well to home decor. I love how you can get a woven look with the yarn without needing a loom. In an effort to bring back the plastic canvas, I've started playing with it in my home decor, and wanted to share these woven rainbows with you! I'm warning you though: these are addictive, and once you start making them, you will want to make them in a million different color combinations! You can also see how I used a plastic canvas to make a yarn chandelier HERE on my website. Circle Plastic Canvas. I love to make rainbows in all sizes. You can find 4.5", 6", 9.5", and 12" on Amazon. Craft stores carry a variety of sizes too. Yarn. Chunky yarn doesn't work well for this project, as it it hard to fit it into the eye of the needle. Yarn darning needle. I like size 18. Sold in a package on Amazon HERE. Embellishments if desired: pom poms, pom pom trim, etc. Hot Glue Gun for gluing embellishments. Begin by cutting your circle in half. There is a line down the middle, so it makes it easy to keep your cutting lined up. You can make two rainbows out of one circle. To find out how much yarn you will need, lay your yarn around the outside edge of your circle and include yarn at each end for your trim. Now mark that spot with your finger and double that length. I have found that the outer layers especially use double the amount of yarn as goes around the edge. You may even want to add a little extra to the first few rows of your rainbow. The inner rows aren't usually double the amount, but I just keep doubling the whole time. It is easier to have too much yarn than too little. This isn't very mathematical, but it seems to work pretty well. If you want a fuller rainbow with more fringe at the bottom, you can even double again and have two long strands coming from your needle. If you want your rainbow to have a cut-out center arch, you can also cut that at this time. I like the look of both the rainbows that have a cut-out and the ones that are solid. It it completely up to your preference. You can even use this baby rainbow later on for another rainbow! I always like to count how many squares are in the radius of my circle so that I can plan my colors accordingly. If I have 24 squares in the radius and I have six colors I want to use, each color will have four rows in the rainbow. It usually isn't an even number though, so I just give a few rows a little more or less. I also cut all of my strands of yarn for one color at the same time. It makes it easier. I'm wanting a more full rainbow this time, so I measured, doubled, then doubled that amount to get my string length. I slid my needle into the center of the strand so that I have double yarn going in each square. I also like all of my fringe strands to be coming out of the front side of the rainbow, so I begin and end with the yarn strands coming out of the front. Pull the needle through the front side of the canvas until you have the fringe length that you like on that side. We are going to be using a backstitch all the way around this rainbow. You can skip a few squares, but keep in mind that your rows will less round if you skip too many. I like to skip 2-3 squares at a time. The number doesn't always work out evenly with skipped squares, and at the end you may end up with only one square. That's okay too. Just back stitch it like normal, and you won't notice much when it is finished. So, skip 2-3 squares then stitch back into the canvas. The yarn will now be back on the front side. With the yarn and needle now on the front side, go back into the first square that you went into. You have created your first stitch. Now with the yarn and needle on the back side again, go up 2-3 squares above this stitch and go through the square. You will then go into the same square as the top of the first stitch. You will continue this backstitch all the way around the rainbow until you get to the end. Make sure you have some fringe at the other end. Continue this pattern with all of the rows that you want in this color. To add a second color, measure around your rainbow and double the yarn. Then double that amount if you want a fuller rainbow. You will continue to backstitch this color in the same manner as the first color. When you have finished all of your rows, you can trim your fringe to make it even. I have often just used the edge of a table or counter to help me line it up, but it also helps to use a large ruler to trim the ends. If you want to add any embellishments, now is the time to add them. I like adding handmade pom poms to the bottom, and I love adding pom pom fringe to the outside edge. Use hot glue to apply your embellishments. And that's it! These fun rainbows are perfect for a little girl's room or for your craft room or gallery wall. I just can't get enough of them! My kids go back to school next week, and let's face it, I'm about ready for school to start! We decided to fit in one more EASY craft camp this week (since it's burnout time! ), and it was a hit! We made glitter foam fruit keychains. That's a mouthful! You need very few supplies, but the results are colorful and perky. And these keychains are perfect for attaching to their backpacks when they go back to school! Self-adhesive glitter foam sheets. I wanted a variety of colors so that the kids could do lots of different fruits. Large keyring-sized jump rings. This pack from Amazon comes with 100 keyrings. You can use the extras for other crafts! Small jump rings. This pack also contains extras, but they are great for other crafts. Sequins, pom poms, rhinestones, or other decorative items. I've linked to a few on Amazon. We want our keychains to be cute on both the front and the back, so for this project, we have to make doubles of everything we cut out. Because the foam is adhesive, there is one side that can be drawn on to help give you a guide for cutting. We found the foam easier to work with when we cut it down into smaller pieces from the large sheet. I traced my circles for my lemon with a cup, then folded the foam sheet in half, then cut. To make the lemon segments, I drew them on the paper side of the foam, then folded in half and cut. Sometimes the paper back doesn't cut very cleanly, but rest assured that the foam is actually cutting cleanly. Before you start sticking pieces together, it is best to punch your hole where you want your keychain to go. Something to keep in mind: these keychains are made out of foam. It is not super strong and can tear easily if pulled, so treat these keychains as a decorative item, not as something to handle a lot. You need to put your hole close to the edge so that a small jump ring can fit through it, but not too close so that it rips. I found that my hole punch could punch through two sheets of foam at a time. If you are going to be adding more layers to your design, make sure your holes match up and punch through two sheets at a time. Now you can start sticking your pieces together. Peel the paper backing off the adhesive, and stick your pieces together, glitter side out. The adhesive sticks really well to itself, so no extra glue is needed. If you want to stick the adhesive to the glitter like my lemon segments, however, you will need to add a little tacky glue. You could also add a little glue around the spot where you punched your hole, just to reinforce the hole a little more. You can also add sequins, rhinestones, or small pom poms as well at this point. To finish off your keychain, you can add your small jump rings, and attach a keychain. You can make your keychain as dangly as you'd like by adding more small jump rings. I used my fingernails to open the rings, but you can use a jump ring tool as well (which might be a good idea if you just got a manicure!). Sometimes it is a little tricky to feed the jump ring through the two layers of foam, but stick with it. As long as you didn't place your hole too far from the edge, you'll get it. Now you have a fun pop of color to add to your backpack! Again, keep in mind that these are not really intended to be pulled because of the foam, but they do make a fun decoration! My oldest daughter had a few friends over to make these, and I was impressed with their creativity and imagination! They were able to make these in about 15 minutes, so it was the perfect, end of summer craft! Did you ever use Shrinky Dinks when you were young? I remember thinking that they were the coolest! If you don't know what Shrinky Dinks are, they are basically a thin sheet of plastic that you can draw on, then bake in the oven to become a tiny little hardened piece of plastic. For this activity, we used this shrinkable plastic to make little pins to stick on backpacks, shirts, jackets, you name it! Pins are all the rage right now, and it is really fun to design your own! Shrinky Dink Plastic Sheets. We bought this pack of 25 sheets from Amazon, and it will last us a long time! Pins and Pin Backs. I bought this pack of 100 pairs from Amazon as well, and they are the perfect little size. Clear Gorilla Glue. I have used this glue for many projects this summer! It sticks to just about anything! Sharpies or other permanent markers. Scissors. Finer tipped scissors work well with this craft. To begin, you need to draw designs of your choosing onto the clear plastic. Our set of plastic actually came with a template of black and white designs that you can trace. You could also print off clipart designs to trace. We ended up doing mostly free-hand designs. Your design will shrink to a very small size, so make sure you make it big enough, but not too big for your pin. I made most of my drawings around 1.5"-3". Darker marker colors will show up better. After you have drawn your designs, you need to cut out your pieces. The plastic does have a tendency to tear if you are trying to do a detailed shape, so it is often better to just do a smooth, rounded cut around your design. The plastic will stay in this shape when it is shrunk, so if you have any sharp edges, make sure to trim them to make them smooth before baking. Bake your plastic according to the directions on the package. I put parchment onto a baking sheet then put our plastic pieces on the parchment for baking. The plastic does get a little tricky to peel off of the parchment, and it will leave a little residue on the back of your plastic, but it isn't very noticeable once you put your pin on. There was more residue when I tried putting the plastic directly onto the baking sheet, and it was harder to get off of the baking sheet than the parchment. I turned on my vent fan and opened a window to try to keep any fumes to a minimum. It's fun to turn on the oven light and watch these cute little designs shrink up. It only takes about 4 minutes for them to shrink! When they come out of the oven, they will be hard and tiny. Once you pull them out and let them cool for a minute, you can remove them from the parchment. Now it's time to put the pins on! Slightly dampen the back of your plastic designs with a wet paper towel (Gorilla Glue needs one side of the glued pieces to be slightly wet), and apply a small dot of Gorilla Glue. Put one of the pins into the glue and allow to dry for a half an hour or so. After the glue is dry, you can put the backs onto the pins. Now you have the cutest collection of unique pins! These are perfect for sticking on your backpack or on your rainbow bag that we made a few weeks ago! Your design options are limitless, so get your creative minds flowing! My temperature blanket is growing! And getting more dark pink! I even had to go buy another skein of the dark pink yarn because it was so warm last month. I only have five more months to go! It is no secret that I love cacti and succulents. If you came into my house, you would see them all over. The last time I counted, I think I had around 30 cacti and succulents! I just love these little plants. For our Craft Camp activity this week, we made some painted rock cacti. And these little guys don't even need to be watered! Small flower pot. Even a paper mache pot will work. Rocks from your yard. You want to look for rocks that are sort of round and long. Filler for your flower pot. I used shredded kraft paper. Once you raid your yard for some good-sized rocks, you need to make sure you wash them off. The paint won't stick to dirt. Then start painting! We used a variety of green paint for the base and added white and lighter or darker green for the spines and spikes. Get creative with your spikes! Cacti come in so many varieties! I also found two little rocks to act as "flowers" for my cacti. I painted these yellow and pink. These will be glued to the tops of two of my rocks. You can also use artificial flowers, pom poms, buttons, or beads as flowers on your cacti. When my paint was dry, I glued my "flowers" to the tops of two of my cacti rocks using clear Gorilla Glue. You have to dampen one of the surfaces for the Gorilla Glue to work. I sandwiched the flower rocks between the cacti rocks to help hold them in place while they dried. Note that I'm only gluing them to one rock, not two. When your glue is dry, you can add your cacti to your flower pot. Depending on the size of your rocks and flower pot, you may need to add some filler to your pot to boost up your rocks. I used some shredded kraft paper in the bottoms of ours, but you could also use sand, pebbles, or even pillow stuffing. Arrange your cacti rocks to your liking, and you have a fun little decoration! My kids even wanted to paint their flower pots a little which you could do too. I don't have to worry about my kids getting poked by these cacti, and they won't die in their rooms! Win win! My temperature blanket is halfway complete! I can't believe that June is already over and that I only have six more months to finish this blanket! We had some warm days this month, and I even got to add two 100 degree+ days to the mix. I am also halfway through my temperature cross stitch! I love seeing this come together each night. It is super simple to cross stitch one little box, but it is so rewarding to see it all together. This session of Craft Camp is actually inspired by a craft we did at my 10-year-old daughter's birthday party last year. We learned a few things after making these dream catchers the last time, so we gave it another go with some new techniques. Dream Catchers are easy and eye catching, and you won't mind having your kids hang these up afterward because they look so cute! Macrame hoops. I bought mine from Amazon, and they have a great selection of different sizes. I really like the 5" size, but any size will work. To begin, cut a strip of your fabric to wrap around your hoop. The fabric gives the yarn something to grip to as you are creating your inner design. When we made dream catchers at my daughter's birthday, we didn't cover the hoops with anything first. The result was a lot of slipping yarn that wouldn't stay put on the ring. You could also cover your ring with yarn if you would rather, but it takes a bit longer to do that. I used just a dot of Tacky Glue to secure the fabric to the ring and wrapped the fabric all the way around the hoop. Now you can begin making your design inside your hoop. Tie your yarn to your hoop by making a knot. I didn't worry about the tail end of my yarn because the design on the inside helps hide that tail. Then start going over and around your hoop to make a design. For every few turns, I wrapped the yarn around the hoop almost making a knot to help secure your design. If it comes unraveled, this can help keep it from completely unraveling. You can add beads here and there as you go, and the beads can be moved around on the strands after you have your design complete. When you feel like you like your design, you can again tie your yarn to the hoop with a knot. Add a hanger to your hoop as well using a piece of yarn that you tie to the top. Now you will add your fringe to the bottom of your dream catcher. Cut strands of yarn to tie to the bottom of your hoop. I like to double the length and tie in the middle of the strand so that I can get double the strands with only one cut and tie. You can find really fun yarn at your favorite craft store. I love the yarn that looks feathery. I found this aqua yarn at Hobby Lobby and it is called Haute Fur yarn. I also like the soft, chunky, colorful yarn as well. You can even add beads to this fringe if you'd like. Continue to add your yarn to the bottom until it is as full as you would like it. And that's it! You have a cute, colorful dream catcher to hang in your kids' rooms. Hopefully they will catch all your kiddos' good dreams so that moms and dads get good night sleep too ;) ! This week's Craft Camp involved a little fabric painting and a little pom pom making. We painted rainbows (or whatever design you would like!) onto tote bags. It's a fairly simple craft, but it creates something really fun! Canvas Tote Bags . You can also do this project with aprons, t-shirts, kitchen towels, etc. Acrylic Paints. These can be any brand from the craft store. Fabric Paint Medium. I used the DecorArt Americana brand, but any other brand of fabric medium would work as well. To begin, select the acrylic paints that you would like to use. If you are making a rainbow, you don't actually need very much paint. To make the paint more fabric friendly, add some Fabric Painting Medium to each color. I used a 2 to 1 ratio of Fabric Paint Medium to Acrylic Paint. The Medium makes the paint a little thinner and easier to spread. It also makes it a little softer on the material so it isn't so thick and hard. Mix your paint and paint medium well then begin painting your rainbow. I decided to make thick rainbow stripes, so I only ended up having enough space to make four stripes on it. You can make the stripes in rainbow color order, but we thought it would be fun to mix up our rainbows a little and paint them in colors you wouldn't expect. While you wait for your paint to dry, you can start making your pom pom clouds. Using any pom pom maker or even your fingers, make a pom pom out of yarn. You can decide how many you want on each side of your rainbow and you can even decide to make your pom poms different sizes. We made two different sizes for our bags. Using a hot glue gun, apply your pom poms to your bag. These pom poms can go under your rainbow like clouds, or they can just be used to add extra embelishment to your bag. You can heat set your design (just the paint, not the pom poms!) using an iron to make it washable. Because we painted on bags that I wouldn't really wash anyway, we didn't worry about heat setting. These are perfect for library book bags, pool bags, or for taking on road trips. Enjoy your perfect, little summer bags! For our second session of summer craft camp, we made iron-on vinyl t-shirts. I want to incorporate different varieties of crafts for our weekly camp sessions. I thought this one would be a great way to teach my kids how we can use computers to make a design, and then how we can apply that design to a t-shirt. This isn't a sponsored post, but we did use my Cricut and it worked wonderfully. T-shirts. You can always find t-shirts at craft stores, but I don't love how they are unfitted. I ended up getting some colorful shirts at Children's Place and Target that are more fitted and were probably the same price as the craft store. Iron-on Vinyl. I used the Cricut Iron-on material because I had it on hand. If you look in the electric cutter section of your craft store, you can find other brands and colors. Amazon has a great selection as well. They have glitter iron on HERE and foil iron on HERE as well as solid colors HERE. An iron + ironing board. An electric cutting machine and computer. I used my Cricut and Cricut Design Space to make our designs, but you could use whichever cutter you have. If you don't have an electric machine, you can make designs with scissors. Just keep in mind that you will need to cut your design in the mirror image of how you want it to appear on your shirt. To begin, your kids need to brainstorm ideas of designs they would like to put on their shirts. My kids were coming up with all sorts of ideas: ice cream, cats, Harry Potter, cupcakes, etc. Some ideas lend themselves to iron-on images a little better than others. We searched in Cricut Design Space for their designs, and found images that were fairly simple and would show up well on shirts. I purchased several images from the Cricut library that I didn't already own. We even used the t-shirt template on Design Space to see how it would look. The final designs my kids chose included starfish, ocean waves with the word "Waves" cut out, a panda, and a cat and some text from the Warrior Cats book series that my oldest is obsessed with. Cut out your design onto the vinyl, and make sure that you cut using the mirror image so that your design will show up the correct way on your shirt. You will need to peel away the excess vinyl from the plastic, and the best way to get those little pieces out is using a weeding tool or a large quilting needle. Once you have your excess vinyl removed, you need to decide where you want to place your design. You can try positioning it around the shirt to find what looks best. My oldest daughter had her own idea about exactly where everything needed to go. Even though it may not have been what I would have chosen, I was impressed with how she designed it. Now iron-on your design. You want to iron the shirt just for a few seconds before applying the vinyl so that the shirt is warm. This helps the Iron-on material to stick better. When you iron-on your design, use a towel under the iron to prevent sticking. Follow the directions on your iron-on vinyl, but mine said to iron the front and the back for about 30 seconds to one minute each. Then you can peel away your plastic and see your completed design. My kids enjoyed this craft, although it was a little trickier because we were only using one computer and they had to take turns figuring out their designs individually. It isn't as great for a big group because of the individual time spent on the computer, but you could even have kids pick their designs ahead of time, then cut them all so that they can all iron-on at the same time. I did all of the ironing because I didn't want my kids to use the iron, but if you have older kids, they may be able to do that part with supervision. They were able to help with peeling away the excess vinyl and with showing me how they wanted their designs positioned. My kids have loved wearing their shirts and telling everyone that they designed them! It's fun to have a one-of-a-kind shirt to wear in the summer!